Vancouver’s many parks and gardens are ideal showcases for the beloved trees, but there are also a number of urban places to view these pink and white beauties. VanDusen Botanical Garden boasts more than 100 cherry trees, representing 24 varieties. For a truly peaceful (and cultural) experience, make sure to visit the Nitobe Memorial Garden at UBC, where you’ll find colourful cherry trees in a traditional Japanese garden setting. 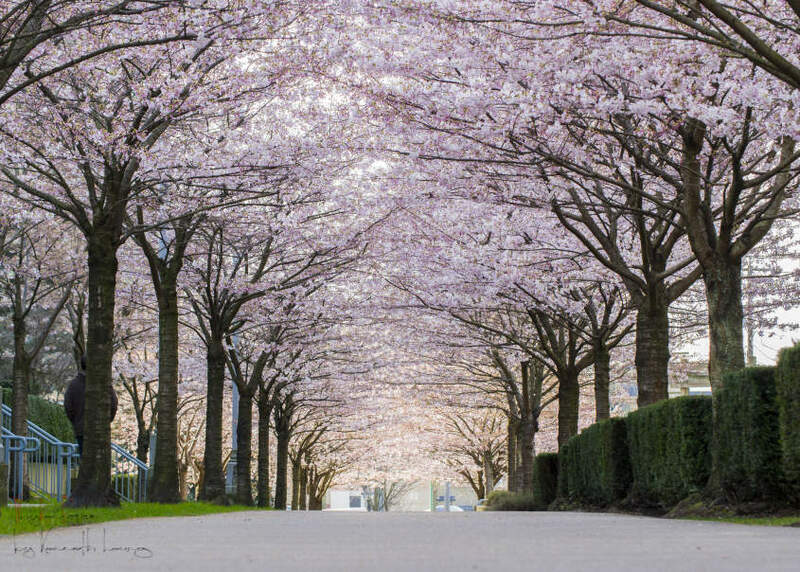 Each year, the Vancouver Cherry Blossom Festival introduces an array of events to celebrate the blooming of the trees. From bike rides to art classes, these community activities bring people together to enjoy the natural splendor of spring. The official festival kick-off is a culturally rockin’ good time with performances that honour Vancouver’s multicultural heritage — all amid a sea of cherry blossoms, of course. Plein-air instructors lead watercolour, pastel, oil and acrylic painters in art-making sessions right inside the garden, helping them to capture its cherry trees, rhododendrons, crocuses and many other plants in their work. Six walks through some of Vancouver’s spectacular spring gardens are led by notable tree enthusiasts who help visitors find the city’s most beautiful blooms, talk about their origins and help identify different varieties. Vancouver’s original 500 cherry trees were a gift from the mayors of Kobe and Yokohama in the 1930s, thanking the city for honoring Japanese Canadians who served in WWI. Celebrating the city’s long friendship with Japan, this family-friendly festival-within-a-festival includes tea ceremonies, ikebana (flower-arranging classes), sake tasting, geisha dances, taiko drumming, kimono demonstrations, Japanese cuisine and much more. Visitors are invited to view the cherry trees from atop two wheels with Velopalooza, enjoying a guided ride that weaves through Vancouver’s most blossom-laden neighbourhoods. The cherry trees are sure to spark a creative sensation in all who witness them, and poets and non-poets alike are invited to submit haikus on the subject to festival organizers. The winning poets’ works will be published on the festival’s website.